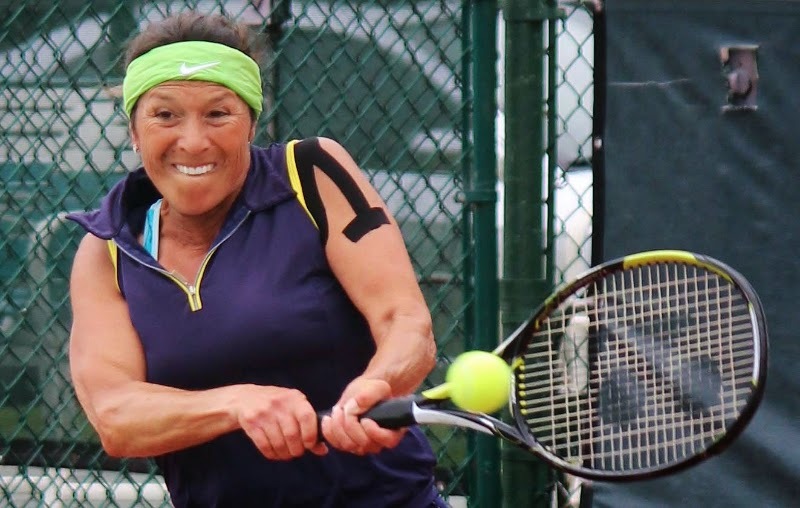 Three Northern Californians have reached the 50-and-over quarterfinals of the USTA National Senior Women's Hard Court Championships in La Jolla. Third-seeded Erika Smith of Oakland, fourth-seeded Tracy Houk of Montara and fifth-seeded Judy Newman of Scotts Valley advanced with straight-set victories today in the second round. Smith outplayed Dorian Sailer of San Diego 6-2, 6-4, Newman trounced Colleen Clery Ferrell of San Diego 6-0, 6-1, and Houk routed Lis Andrade of La Quinta 6-1, 6-1. Houk has reached the final for four straight years, winning the title in 2013. Top seed and defending champion Ros (Fairbank) Nideffer of San Diego also coasted into the quarterfinals. Nideffer, a 54-year-old South Africa native, climbed to career highs of No. 15 in the world in singles in 1990 and No. 12 in doubles in 1986. She reached the Wimbledon singles quarterfinals in 1988 and 1989 and won two French Open women's doubles titles (with Tanya Harford of South Africa in 1981 and Candy Reynolds of the United States in 1983). Two other NorCal players, third-seeded Martha Downing of Shingle Springs and fifth-seeded Leslie Airola Murveit of Portola Valley, reached the 60-and-over quarterfinals. The tournament also features 70-, 80- and 90-and-over age divisions. All singles and doubles finals are scheduled for Saturday.